With the concept of a butterfly garden in place, the presence of butterflies and moths enlivens any landscape. Both are members of the order Lepidoptera, and are indicators of a healthy ecosystem. Butterflies and moths are important pollinators, enabling plants to pass on their genes, and facilitating the production of our food. Welcoming these beautiful creatures into your garden is as easy as providing for their basic needs: food, water, shelter and a place to raise young. Plant flowers as a nectar source for the adult insects. Think about what will bloom at different times of the year-some butterflies emerge from hibernating early in the spring and are out searching for food on the first warm days. Others need extra energy as they prepare to migrate in fall. Having a range of bloom times will increase the number of species that visit your yard. Also, consider planting flowers in larger masses, as opposed to dotting 'one of everything' around a flower-bed. When a butterfly sees a big target of color, it is sure to home in on it. Dramatic swathes of color are attractive to people, too! Grow host plants for the butterflies to lay their eggs on, which will be the caterpillars' food when they hatch. 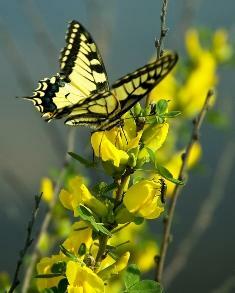 Most species of butterfly have just one or a few species of plant, tree or grass that their young can feed on. Moth caterpillars are generally less fussy about their food. A shallow puddle will provide butterflies with the minerals they need. Their diet is also supplemented by feeding on fallen fruit, mud or dung. Plant shrubs to provide undisturbed places for them to make cocoons or chrysalis. Some butterflies migrate to warm climates during the winter, while others stay in the same area year round, over-wintering as a pupa or adult. It's helpful to leave some leaf litter or a brush pile in the corner of your garden for them to take refuge in. *Shrubs also serve to create a sheltered spot for butterflies to feed. Figure out where prevailing winds usually blow from, and plant your flower-bed so it is out of strong winds. Garden organically for a truly butterfly friendly yard. Any use of pesticides jeopardizes sensitive animals such as butterflies and moths. When you see a caterpillar munching on a plant, don't panic- it's a future butterfly! Most insects can get all they need from your plants without compromising their health-in fact they probably evolved together. Some tolerance of ragged leaves may be necessary, but it is a small price to pay for the loveliness of having butterflies around. Find a good field guide to identify and learn about your new friends. If you are worried about damage that insects are doing to a particular plant, be sure to correctly identify the 'pests' before taking action- your county extension service can help you. Listed in the column to the right are some common butterflies and the plants that their caterpillars eat. They find these plants by landing on them and 'tasting' them with their sensitive feet. While many of these plants are very attractive in the butterfly garden, and some may be valued native wildflowers in your region, others may be though of as weedy. Consider promoting bio-diversity in your yard by setting aside a section of your garden for wild plants-often they are the ones most useful to wildlife.